LM series vertical mill is the newest grinding machine of vertical mill professional manufacturer-ZENITH , which is designed specially to solve the problems of low capacity and high consumption of traditional industry mills. 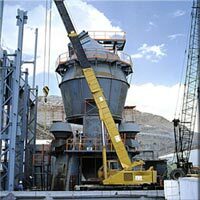 With a decade of years' research of mills, our vertical mill is designed and manufactured based on advanced design idea, and integrates the advanced international technology and years of mill-producing experience. LM series vertical mill adopts reliable structure and reasonable process flow; it is ideal equipment that integrated with drying, milling, classifier, and elevator. Especially, this vertical mill can fully meets the requirement of clients in the high production of powder and its main technical and economy indicator reaches the international level. LM series vertical mill can be widely used in cement making, power, metallurgy, chemical and nonmetalliferous ore industries. This series vertical grinding mill used to grind lumpy, granular and powdery materials to the required size. 1. LM series vertical mill can crush, dry, grinding, classifying, so the system is simple, and occupation area is about 50% of ball mill system. In addition, it can be installed outside, so LM vertical mill will reduce a large number of investment costs. 2. Roller of this series vertical mill compacted materials directly onto the grinding disc, so power consumption is low. 4. LM series vertical mill is equipped with automatic control systems, so remote control makes it easy to operate. 5. When the material stays in the mill for a short time, vertical mill is easy to detect and control the product particle size and chemical composition, to reduce duplication of milling, stable product quality.